For the last two centuries or so, there has been a so-called ‘divide’ in the world of western philosophy between the traditions of mainland Europe (mostly Germany and France), and those of England. The former, following Kant, are referred to as Continental Philosophy, and collectively comprise a number of offshoots such as idealism, phenomenology, existentialism, structuralism, and others. The tradition from England, following the empiricism of Locke, Hume, and Bentham, is called Analytic Philosophy. Four basic themes that characterize Continental Philosophy, especially as opposed to Analytic, can be broadly stated as the following: a rejection of scientific methods as the best or only way to understand natural phenomena; a dependence on historical context for formulating philosophic problems and solutions; a belief in human agency as the basis for any possible experience or transformation (personal, moral, political, etc. ); and a general reaction against the success of the natural sciences in lieu of emphasis on metaphysics and the redefinition or formulation of philosophy itself. The topic of this essay will be a brief summary and discussion of the ideas of Martin Heidegger, a German philosopher who has been called the most important and influential thinker of the 20th century in the Continental tradition. In a certain sense, Heidegger is the prototype of the modern Continental philosopher, and to understand him will allow us to grasp much of what came before and after, including the state of the ‘divide’ today (for a recent discussion on this last topic, see the interesting articles here and here). One of the major criticisms directed towards Heidegger is the inaccessibility of both his writing style and his ideas (called obscurantism by some critics), which I find to be an almost unforgivable fault in any philosopher (which is also ubiquitous in the Analytic school). In my opinion, a philosopher should help to unravel reality and explain things clearly, rather than rendering them even more unintelligible. The main reason for his difficult style is that he was attempting to invent a whole new philosophical vocabulary and to change the course of philosophy after what he saw as a wrong turn as early as the time of Plato. His main focus was the idea of Being itself, and what it means to exist. My reason for writing on Heidegger is to begin to express my own evolving opinion, which has so far moved through three phases: curious interest in his ideas and influence; dismissal of him as misguided and possibly irrelevant; and gradual pragmatic acceptance of the potential usefulness, and maybe even deceptive simplicity, of his ideas. Being as brief as possible, I will give an outline of his life, his most important work Being and Time, his later works, some criticisms, and, most importantly for me, how we might understand and use his philosophy. 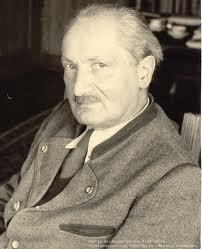 Heidegger was born in 1889 in south-west Germany, raised as a Roman Catholic, and prepared to enter the priesthood. He became interested in philosophy, however, and completed his doctorate in this area in 1913. He began teaching at the University of Freiburg from this time as a junior associate of Edmund Husserl, the philosopher of the new school of phenomenology. Heidegger continued teaching without interruption until the end of World War II, including dozens of students who would later become highly important philosophers in various of the Continental traditions. In 1927 he published Sein und Zeit (Being and Time), which revealed a break with Husserl and all modern philosophy, and a new emphasis on a fundamental ‘phenomenological ontology’. He became politically involved with the rise of the Nazi party in 1933, which he seemingly supported until their final downfall in 1945. He was quickly appointed as the rector of the University of Freiburg in 1933 because of his political support, and was forced to retire in 1946 after the process of ‘denazification’. He was allowed to regain his post and teach regularly in 1951 until 1958, when he retired and spent most of his time in seclusion at his home in the Black Forest, near the mouth of the Danube. He died in 1976 at the age of 86. The level of his personal support of the Nazi party is obviously a highly controversial issue. In a 1966 interview with the magazine Der Spiegel, he attempted to portray his support as a way to exert a positive influence on the Nazis, and to protect his university from becoming politicized. He claimed that he was an early idealistic supporter until he changed his mind after the 1934 ‘Night of the Long Knives’. There is certain evidence that points to the fact that he was much more involved than he claimed, and quite sympathetic to the Nazi cause even until the end of the war. His student Emmanuel Levinas later said, “One can forgive many Germans, but there are some Germans it is difficult to forgive. It is difficult to forgive Heidegger.” The main issue for philosophers and historians is to decide how much these sympathies could have influenced his philosophy itself. The subject should always be brought into consideration when discussing Heidegger, with the understanding that he most likely made abhorrent personal political choices, either for self-preservation or because of outright support of Nazism. From my reading, I am of the opinion that his political involvement does not necessarily undermine or discount his unique theoretical philosophy. Heidegger’s magnum opus has a completely metaphysical focus, which is more specifically the area of metaphysics called ontology, the study of being. It goes without saying that it takes none of its subjects, evidence, or methods from any actual sciences, but relies on the ‘phenomenological’ method inspired by Husserl. While Husserl saw Phenomenology as a whole philosophical construct (claiming that all of our experience or phenomena, including everything mental, has an object outside of us, independent of us in the world), Heidegger used it as his method to direct our consciousness indirectly towards an access of understanding of our existing state of being, if not the overall idea of Being itself. Heidegger called this access ‘Dasein’, which means ‘existence’, but which Heidegger explained to mean ‘being there’, or the time and place of our already existing being in the world. As you can already see, this is highly abstract stuff, and even the English translations of Heidegger’s terms are less than enlightening. They highlight more of a process for understanding than a simple definition, which is part of the intent, no doubt. I will try to move through his explanation of Being as if it were a map, and which you can hopefully see more clearly with the use of the helpful chart below. At the end, according to my interpretation, you might find that the result of all this abstraction can be surprisingly simple to understand. Heidegger’s Dasein, or ‘being-there’, leads more concretely to the fact of ‘Being-in-the-World’, since it is only in the world that we can exist. The three main aspects of this existing state are called ‘projection’, ‘throwness’, and ‘fallenness’. ‘Projection’ leads to understanding of our existence and future potentiality, ‘throwness’ (because we are always already thrown into the world) leads to our state of mind of ‘facticity’ (that is, the fact of our limitedness), and ‘fallenness’ shows how we are surrounded only by things that are either Dasein or not Dasein, and therefore we understand our falling in time and authenticity towards others (‘the They’). These three aspects add up to the ‘anxiety’ of our existence, because we understand that we are beings moving towards Death. This realization causes both a sense of guilt, as well as our conscienceness of the need to find a solution. This solution, according to Heidegger, is to have ‘anticipatory resoluteness’ towards our impending death. His conclusion is that the nature of Being is only possible to understand through means of ‘Temporality’– that is, all Being is predicated on Time, or, all beings have an end time limit, which is death. So the rather simple result that I referred to earlier is that Being depends on Time, and that Time defines every aspect of our Being. [For more detailed explication of Being and Time, a series of articles by Simon Critchley can be read here]. Soon after publication of Being and Time, Heidegger began a self-confessed ‘turn’ (die Kehre’) in thought that would continue for the rest of his life and comprise the second half of his career. A recurrent theme of this shift seems to be a change in perspective of the entities of Being and Dasein (which is, once again, is merely an instantiation of an already existing being, rather than the separate and independent object of Being itself). In Being and Time, he portrayed Dasein as a sort of ‘clearing’ (as in a thick forest) where phenomena are revealed or uncovered for our understanding; later, the roles reversed as he emphasized the active agency of Being revealing or uncovering itself on Dasein. Some recurring themes in his later works include discussions of technology, poetry, and a reexamination of ancient Greek philosophy. Technology, rendered from its Greek root of tekhne, means the use of tools or craft (mental, as well as physical) to build, create, or control something. Rather than focusing on the tools themselves or the creative result of the technological craft, Heidegger is more interested in the process of revealing of truth that a Being encounters during the process of creation. He thus sees the positive potential in the creation through technology, but that this potential is often squandered because we direct our attention not on the process but on the end result of the action. In fact, Heidegger writes very negatively about what we consider modern technology, and seems to always search for a solution in earlier, pre-technological ages or in natural setting untouched by modern developments or improvements of any kind. What he actually might be intending is rather a way for humans to live peacefully with technology while not letting it distract from our true being. Furthermore, while technology can be dangerous, he thinks it can also be a means of salvation towards our revealing of the truth of Being, which is also the way towards the most profound kind of freedom. This theme, developed over several decades and perhaps best represented in the 1954 essay “The Question Concerning Technology”, is quite difficult to grasp, let alone describe in one paragraph. Nevertheless, in my opinion, it might represent some of the most useful, forward-looking, and fruitful thought in all of Heidegger’s work. Poetry, according to Heidegger, shares the same possibility of technology of revealing something through the act of creation (in this case, the original Greek root for poem comes from poiein, “to create”). He wrote much on the German Romantic poet Friedrich Hölderlin. Some associated metaphysical themes related to poetry (or described in somewhat transcendental or poetic terms) are Heidegger’s attempt to describe being as a ‘dwelling’ in the world. He writes openly of the mystery of this dwelling or habitation, saying that the mystery of being is unintelligible, or a ‘no-thing’. This ‘nothingness’, he claims, is nevertheless a positive ontological aspect. In one sense, our being is simultaneously understood as how we dwell in the world. There is an interesting documentary film called The Ister, based on Heidegger’s lecture on Hölderlin’s poem of that name, in which a long journey up the Danube river accompanies Heideggerian discussions on poetry and technology by four contemporary philosophers. 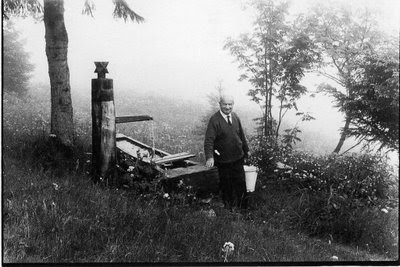 Heidegger working to reveal his Dasein while drawing water from his Black Forest mountain hut. Heidegger came to the view that the line of thinking of all philosophy from Plato through Descartes to the present had been in fundamental error, not only in the loss of the questioning of Being, but also in the preoccupation with science and technology, and by the fact that (so he thought) mistranslations of the original Greek words had clouded our knowledge of the experience of the earliest philosophers. He saw the pre-Socratic philosophers, such as Anaximander, Heraclitus, and Parmenides, as authentically focused on an openness to the question of Being. Much of his later work incorporates ideas and reinterpretations from these philosophers alongside his own ontological ‘uncoverings’. In a certain sense, it seems like Heidegger wanted his own writings to have a similar mysterious and oracular tone of that of the pre-Socratics, some of whose writings only exist in a few paragraphs or scattered apothegms. Even among later Continental philosophers, many of whom were students or followers of Heidegger, almost everyone has something to criticize. Herbert Marcuse, Theodor Adorno, and Jürgen Habermas have all, sooner or later, rejected large parts of Heidegger’s work. Sartre took many of the ideas that comprised his existentialist philosophy directly from Heidegger’s work, but Heidegger stated explicitly that Sartre had misunderstood most of his ideas (who can blame him! ), especially concerning the role of humanism in metaphysics. Alas, when dealing with someone like Heidegger who wanted to redefine the nature, vocabulary, and purpose of philosophy itself, it is obvious that he will become a polarizing figure. This brings us to the final topic of this essay. After this short summary of Heidegger’s ideas, we must now ask how we can begin to understand his philosophy, and to what use it might possibly be to us. As Russell claimed, I think much of Heidegger’s work is, in fact, psychological in nature– this is a common and seemingly harmless characterization that was nonetheless vehemently denied by Heidegger himself. But why should he deny it? Perhaps he thought the profundity of his thought would be harmed by a relegation to mere psychology. The field of psychology only became independent from that of philosophy after the work of William James at the turn of the 20th century, and even Nietzsche, whose influence on Heidegger was enormous, proudly claimed to be a psychologist as well as a philosopher (asking in the last chapter of Ecce Homo, “Who among philosophers before me has been a psychologist?”). Heidegger certainly has virtually nothing to do with logic, ethics, politics, or any of the traditional sciences. He is almost totally consumed with metaphysical questions; specifically, that branch of metaphysics involving being (ontology). Seen from almost any angle, the questions in this field deal directly with a person’s mental and intellectually understanding of his existence which can only really take place rather subjectively in the mind (aka, the psyche). His questions of being, anxiety, fear, and death are fundamentally psychological in nature, but with an interpretive approach rather than the modern emphasis on scientific method and experimentation. This aspect of interpretation, called Hermeneutics, also strongly characterizes Heidegger and later Continental followers. As a side note, Heidegger compares in some respects to a Western version of a Taoist philosopher, or other oriental-style mystagogue. Though thoroughly unliterary, the nature of his psychological work in philosophy, which is expressive and interpretive, would seem to fit more within the tradition of poetry, literature, and art, which figure often in existential philosophies, and which were embraced by Sartre and Camus, for example (both winners of the Nobel Prize for Literature). If we accept this understanding of Heidegger as a sort of ontological psychologist, that now leaves the final question of what use (if any) we can derive from his ideas. There is another documentary film, 2010’s Being in the World, in which five contemporary philosophers discuss aspects related to Heidegger’s philosophy, and we are presented with four different ‘craftsmen’ at work: a Flamenco guitarist, a New Orleans chef, a Japanese carpenter, and an improvisational Jazz ensemble. The point of the film, in my understanding, is to show real-life examples of Heidegger’s idea of the creative impulse as ‘authentic’ beings in the world, showing ‘anticipatory resoluteness’ in the face of ‘temporality’. It is the idea of defining and giving meaning and purpose to our existence through our own personal projects, freeing ourselves from the yoke of conformity of ‘the They’, and, in the process, coming closer to an understanding of our true, ineffable existence. In a nutshell, this sums up both my understanding of the positive aspects of Heidegger’s philosophy, and my idea of how it can also be applied to life. It is something transcendental and poetic, and probably already intuitive to anyone who wants to enjoy or maximize life. Indeed, I do not know that it is not too reductive to claim that my interpretation would be somewhat self-evident to any creative person, even without the need for thousands of pages of somewhat mystifying philosophical text! Satisfied with my own life-affirming psychological interpretation of Heidegger (and I will be skeptical about any accusations that I have misinterpreted him, because his work is clearly too obscure and inaccessible to be open to any single correct and expressible interpretation), I now return to the idea of its place within Philosophy. As I began to describe in an earlier post, Defining Philosophy and Its Uses, my personal definition for Philosophy is the method by which we attempt to analyze truth and synthesize wisdom, which can then be used in the real world either at the level of individual or society. Basically, I think that there are pros and cons with both the Analytic and Continental traditions of philosophy, and that positive aspects can be taken from both, which would seem to make me into something like a Pragmatist. Personally, I am most interested in Ethics and Politics, both in theory and practice, rather than fields such as Epistemology or Metaphysics, which tend to be at the heart of the Analytic/Continental debate. The type of metaphysics in which Heidegger engages has sometimes been considered the very epitome of philosophy, or of doing philosophy, or of philosophizing, in general. As a whole, it is something that can be interesting to certain curious individuals, but which can arguably never achieve much certainty or have any real-world effect beyond the individual psychological level. In fact, whenever new knowledge has been discovered in metaphysics, those areas become separate new sciences, such as astrophysics, neuroscience, linguistics, or even experimental psychology. This is not to say that there is no use for metaphysics today– far from it– but that it may often be best expressed in the form of personal beliefs (religious or otherwise) or creative impulses (art, literature, tekhne). But, contrary to modern sciences or empirical studies, it really cannot prove anything. Another way to put it is that this type of metaphysical speculation might be an engaging activity or an intellectual journey for it adherents, it can never come to any conclusions or increase in knowledge so long as it remains divorced from actual science and the real world. For that reason, I am prepared to deal with questions of metaphysics from the point of view of Pragmatism, while regarding as more immediate and concrete such political and ethical questions as “what is the best balance between freedom, justice, and equality, and the best relationship between the state and the individual.” Accordingly, while we may choose to spend our time in the process of revealing our essence of Being, maybe we could also use some of our limited Temporality to improve something that matters– the state of Being and quality of Existence for some real-life examples of Dasein, otherwise known as Humanity. I find much of your analysis very interesting, although I would caution you against perpetuating many of the myths that separate continental and analytic philosophy. Your assertion that: “One thing that is clearly superior about Analytic philosophy is its method of clarity of language and expression, which would greatly improve most Continental philosophers immediately.” Is, in many instance, just factually wrong. First, there are many continental thinkers who are, in fact, quite readable and clear. Even Heidegger (who as you noted, is regarded a quite difficult) has many clear and precise essays. Second, the analytic tradition is not immune to this lack of clarity, just as any serious academic discipline, analytic philosophy has developed its own internal jargon and structure which is often impenetrable for the uninitiated. Yet, is this difficulty, within both continental and analytic philosophy, truly a problem? Who could be expected to follow a current neuroscience or physics journal without even the most basic familiarity with the field? Similarly, philosophy (on both sides of the divide) requires time, effort, and work. It is an odd bias of modern thought to believe that philosophy, unlike other sciences, should be instantly clear to the layperson. On the contrary, difficult questions require difficult, and often complex, answers; answers which may require the development of jargon and difficult language. Thank you for your word of caution. The line you cited was actually one that I included at the last minute, probably much too carelessly. I actually did not intend to wade much into the big overall question of the so-called ‘divide’, especially in regards to more recent examples, but wanted to focus almost exclusively on Heidegger at this point. I agree with your point about technical, jargon-laden writing of every academic field, including philosophy. While I am certainly not against that, I suppose I do have some desire to see more thinkers and scholars occasionally write at a level of accessibility for the ‘layperson’. When such books do appear they tend to be quite popular and help shape larger debates, but it seems like philosophy in general hasn’t made such popular appeals lately, unless I’m missing something (Alain de Botton?). I echo the sentiments of jleavittpearl – don’t necessarily believe what analytic philosophers say about continental philosophy! 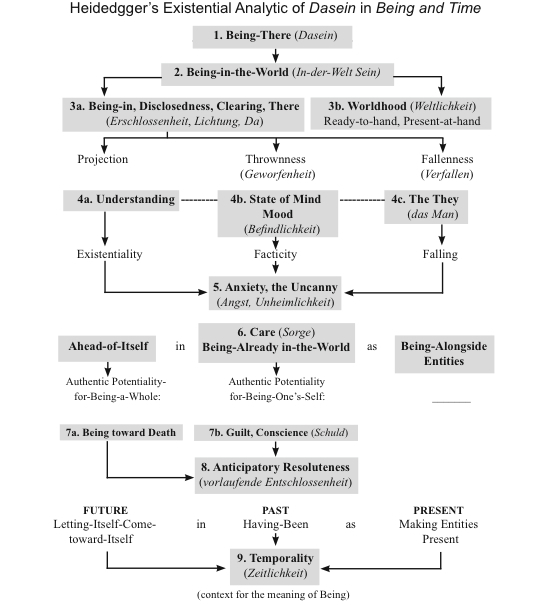 I’m actually interested in the chart entitled ‘Heidegger’s Existential Analytic…’. I’m going to be referring to it in an academic paper and at the moment I will credit you as the original author. If you got it from somewhere else could you let me know where please? I am not the original author of that chart. It was from the notes of an online lecture course I watched called “Modern Intellectual Tradition from Descartes to Derrida” by Prof. Lawrence Cahoone (Holy Cross College). I also really liked the layout and simplicity of the chart and could not find anything at all similar to it on the internet, so I included it in my post for reference. Hope it can be of use in your paper. We can discuss the details if you are interested. You can contact me at mrusso@molloy.edu.